When a patient has been given anesthesia and that anesthesia contains neuromuscular blocking agents (NMBA), it is important to know the level of the neuromuscular blockade achieved. Neuromuscular blocking agents adhere to acetylcholine receptors and restrict the action of acetylcholine. This blocks neuromuscular transmission and the muscle becomes paralyzed. A train of 4 is a medical test conducted to evaluate the level of the paralysis. It is most commonly found in use in the intensive care unit (ICU) when patients are intubated and placed on a ventilator. Why a Train of Four Test? The test is used to help prevent postoperative residual curarization, or continuing paralysis occurring after the NMBAs have been stopped. Approximately 10% of patients who have NMBA infusions for more than 24 hours suffer from residual weakness of the muscles. The results of the train of four test helps physicians measure the proper amount of NMBAs to produce the least side effects. Reducing the amount of drug given and reducing the length of the NMBA infusion may lessen complications and advance recovery after treatment. How Is a Train of Four Test Conducted? 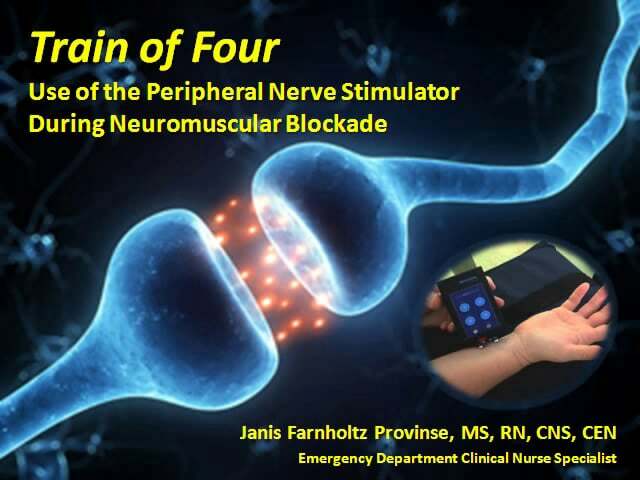 A peripheral nerve stimulator is used to conduct a train of four test. Electrical stimulation is sent to specific nerves, usually the ulnar nerve, and the response is monitored by a machine such as anacceleromyograph. When a train of 4 monitor is in use continuously as it often is in ICU, the stimulations are usually sent to the muscles approximately every 10-12 seconds, typically applied using ECG electrodes. This causes the muscle to contract and fade, and the strength of those contractions is recorded. These sets of stimuli are known as trains because their shape resembles a train. For example, if the test is to be conducted through the ulnar nerve, an ECG dot would be placed on the palm side 1-2 cm from the wrist. A second dot is placed directly above the first, but approximately 3 cm from the wrist. The negative, or black, electrode is fastened to the first dot and the positive, or red, electrode is connected to the second dot. The stimulator is then attached and the voltage is slowly increased starting at 20mA and may go no higher than 60mA. A red light appears when voltage is being conducted. Four electrical currents are sent at intervals of 0.5 seconds and twitching of medial adduction of the thumb across the palm is observed. 1-2 twitches indicate adequate neuromuscular blockade has been achieved. When Is a Train of Four Indicated? When Is a Train of Four Contraindicated? Based on the train of four assessmentby the physicians, the amount of NMBAs prescribed will be adjusted accordingly. Because so many patients suffer from residual weakness and paralysis after infusion of NMBAs, the train of 4 assessment is crucial to the patient’s future recovery level and plays a critical role in their care.